Most would probably guess that the term “dressage” refers to something French people do when no one is looking. But it is actually a form of equestrianism; that is, the skill of riding a horse. In fact, along with jumping and cross-country style riding, dressage is one of the three equestrian sports in the Olympics. 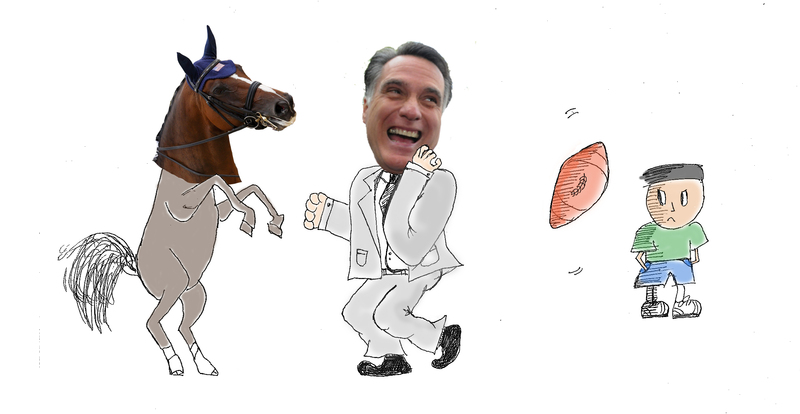 Stephen Colbert (and countless others) mocked this snobbish sport and dismissed it as “horse dancing.” This highbrow hobby first came into mainstream spotlight when it was discovered that Republican presidential candidate Mitt Romney and his wife Ann own a horse that would be performing dressage in the 2012 Olympics. The horse, Rafalca, is one of the few animals Romney did not manage to strap to the roof of his car on a 12-hour road trip. At the Grand Prix level, the dancing is said to be a culmination of extensive training. Horses must trot in place, trot in a circle and perform a movement that even the USDF refers to as “skipping.” And if those aren’t pompous enough, the pièce de résistance is freestyle, in which horse and rider perform specially choreographed routines to music of choice. Hassey said dressage is actually a great way for all types of students to learn the basics of equestrianism, particularly at the basic level Lane Cove works. She said that dressage allows students to expand into lots of different types of riding. She teaches students all backgrounds and ability, and noted that even the late dressage hall of famer Vi Hopkins loved to teach at the foundation level. Lane Cove dressage is, according to Hassey, “accessible to everyone, as it should be.” She believes that this negative elitist perception is due to a combination of the media’s portrayal of the sport and the public’s limited knowledge about horses. Hassey also mentioned how Colbert’s stinging mockery of dressage particularly made people disregard the sport entirely. She recounted how even family friends referred to her as the woman who teaches “horse ballet” after seeing episodes of The Colbert Report this summer. However, she still believes it’s good that dressage was brought into the mainstream because it allows even “Joe Six-Pack” to know a little more about it. It can be costly, selective and exclusive in its professional form, but that can be found in any sport or hobby. Certain golf clubs are more costly than others, and your local dog fancier’s club is nowhere near the glitz and glam of the American Kennel Club’s annual televised show. So, what’s the harm of having elitist sports around anyway? Who cares if you can’t get into a silly sports club? It may have more of a negative impact than you think. University of Rhode Island professor of sociology Jessica Holden Sherwood explained the kind of social harm certain institutes can do. Professor Sherwood said that what separates college elites from professional elites is that a college team will take in anyone, but country clubs just exist for the sake of social exclusivity. The most notable, and arguably most harmful part of elite places like country clubs is that they harden the racial, class, and economic divides in our society. An average person may never be able to make important connections or collect “social capital” that comes with a more exclusive club. Though it may seem like a cliché, people sometimes do get advice, connections, or even a job because they are in the same club as the boss. So while it may not be the most detrimental setbacks people and schools of modest means encounter, it undoubtedly denies them the opportunities the more fortunate have access to. Miranda Materazzo is a freshman journalism major who prefers hippotamous hip-hop to horse ballet. Email her at mmatera1@ithaca.edu.